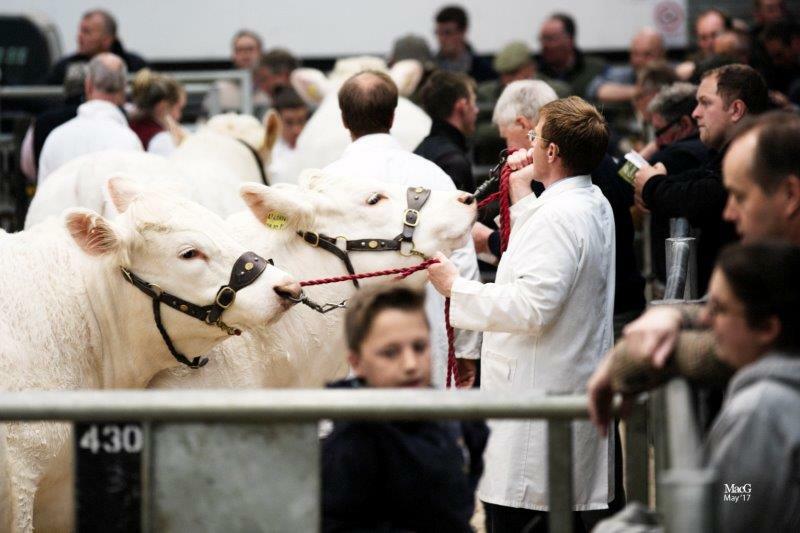 Charolais bulls met a ready trade with strong commercial interest bolstering bull averages to £5158.13, an increase on last year of £151 with five more sold. 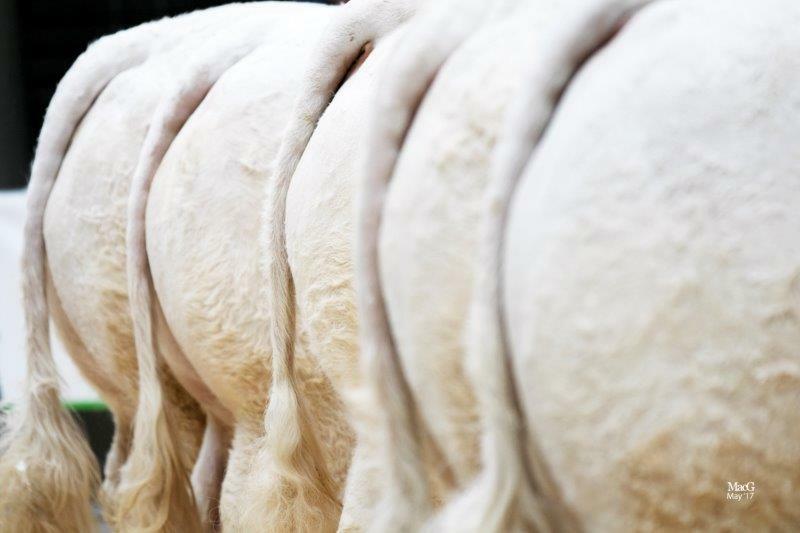 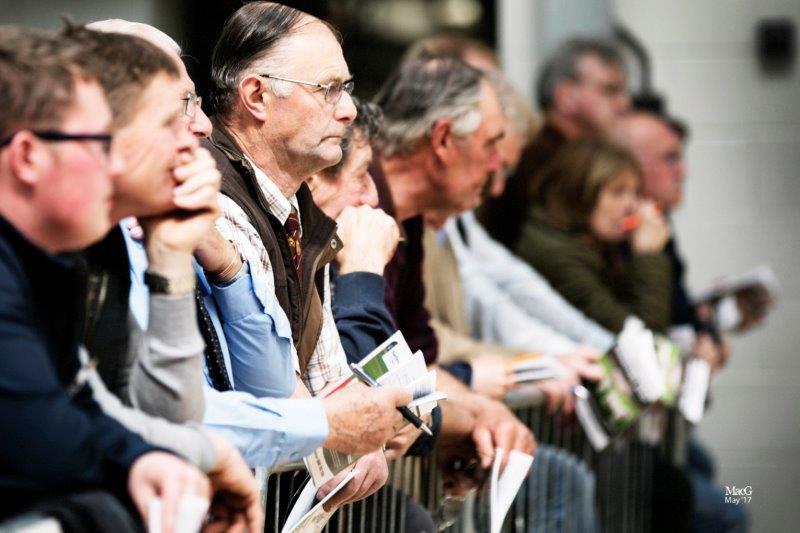 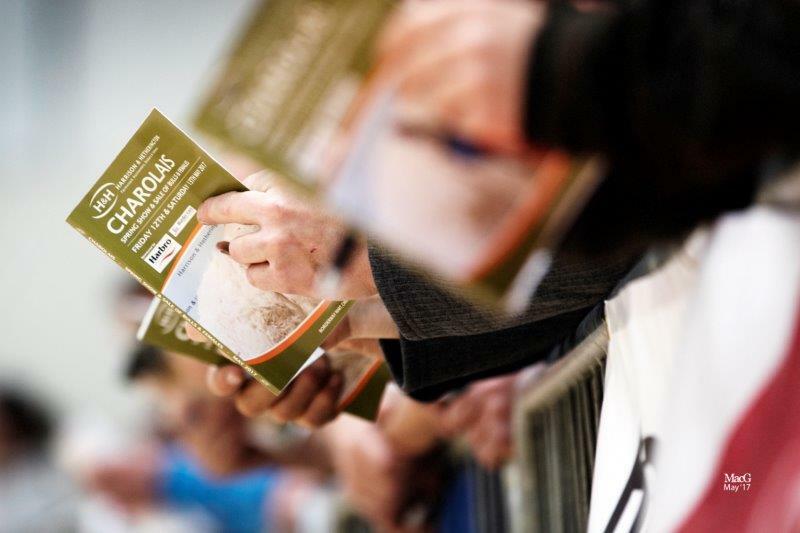 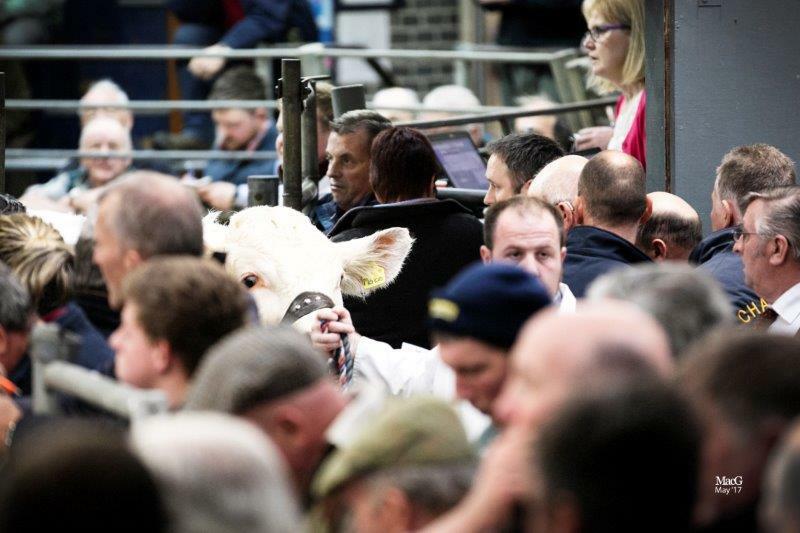 Bidding peaked at 12,000gns, 28 lots traded at 5,000gns and above, 72 bulls sold with the clearance rate also up on the year by 14% to 82%, at Carlisle on Saturday 13 May. 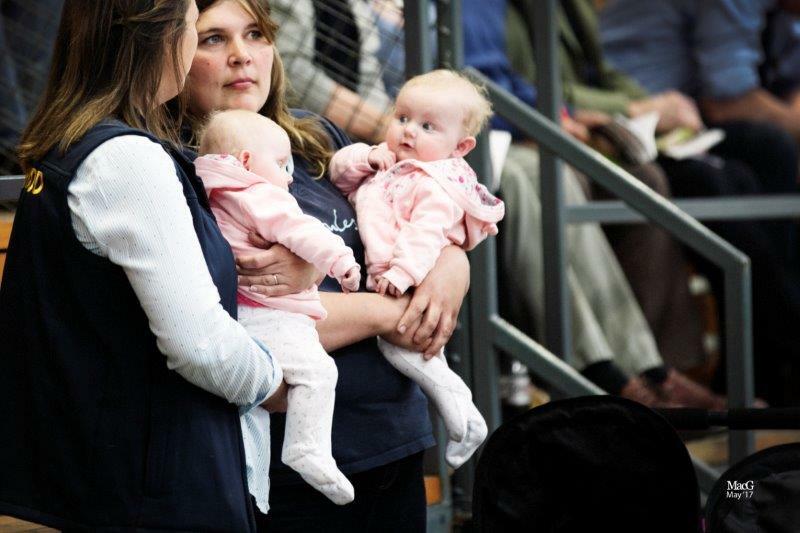 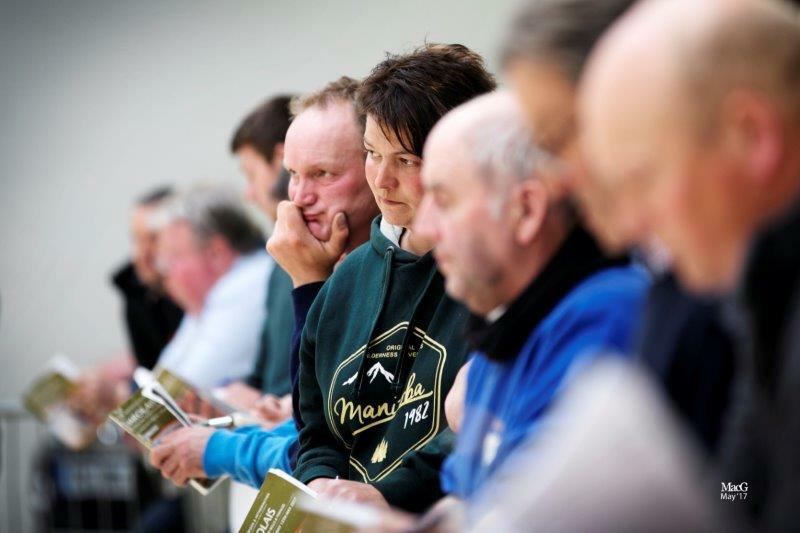 New Society CEO Peter Phythian commented “This is the fourth consecutive Charolais sale where both the averages and clearance rates have increased, driven by the success of Charolais sired suckler calves who are topping the markets on weight for age”. 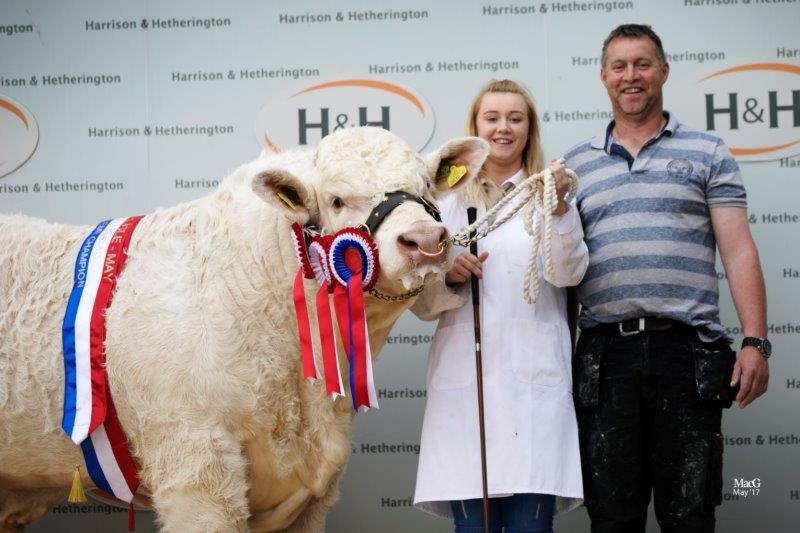 The trade topper was the supreme, male and junior champion McCaldrick McIntoish from breeders Sean and Martina O’Kane, Dunloy, Co Antrim. The 15-month-old McIntoish is the very first calf to be bred by the O’Kane family and is sired by the 16,000gns Royal Welsh reserve champion male, Anside Foreman and out of the Irish-born Aghafad Hope. 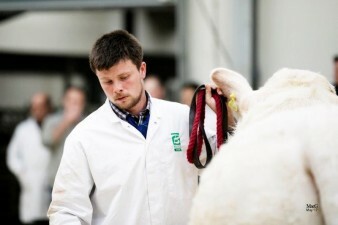 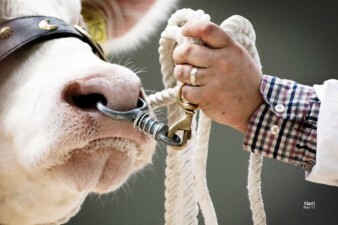 He was purchased for 12,000gns by Highfields Park Farm, Hartfield, East Sussex. 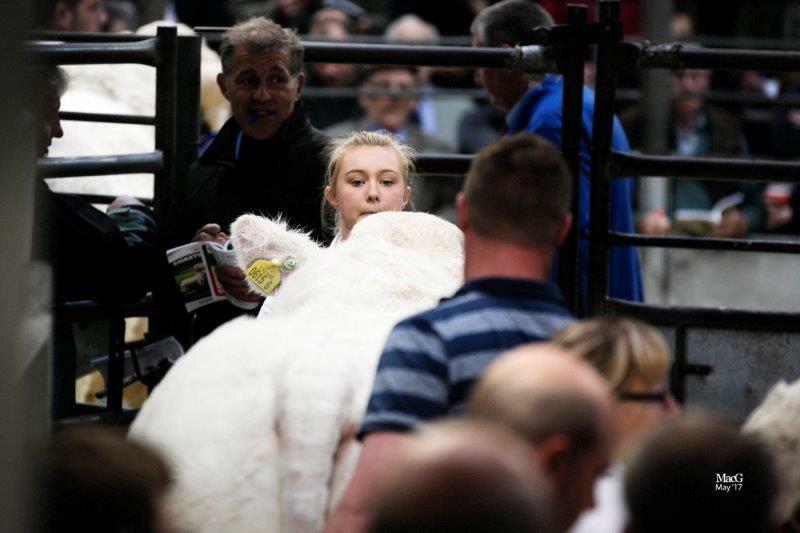 Next and selling for 11,000gns to Perthshire based breeders David and Nick Walter, was the October-2015 born yellow ticket winner Gretnahouse Lunar from Alasdair Houston, Gretna Green, Dumfriesshire, who went on to sell a total of three to an average of £7,700. 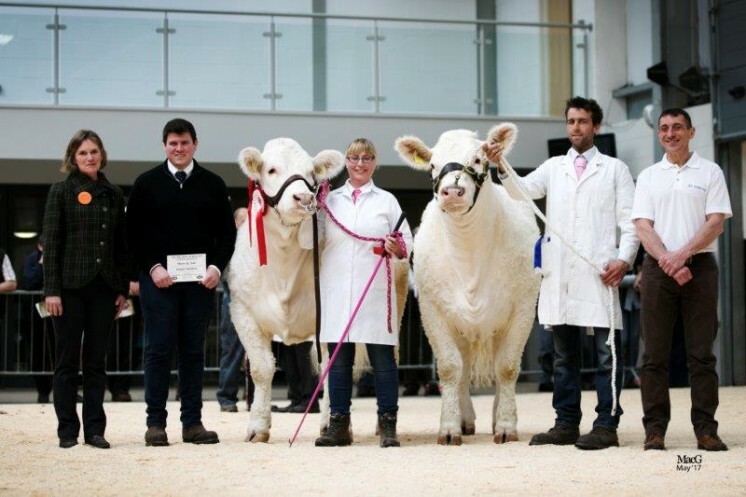 His sire is the 12,000gns Carlisle reserve senior champion Wesley Equinox and his dam is polled Gretnahouse Hazel who goes back to the Swedish Nynas Viril Av. 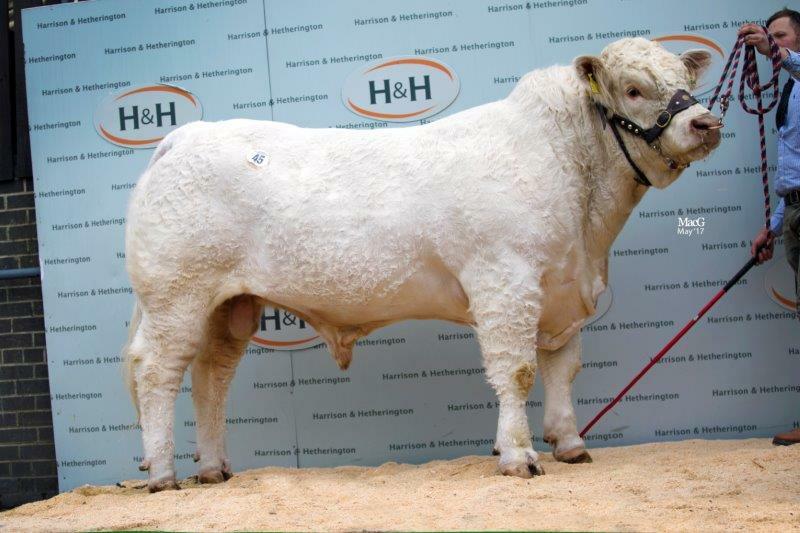 Following on at 10,000gns was another yellow ticket winner, the 18-month-old Caylers Lincoln whose breeding includes sire Balthayock Hamish and homebred dam Caylers Hostess who goes back to Thrunton Dominator. 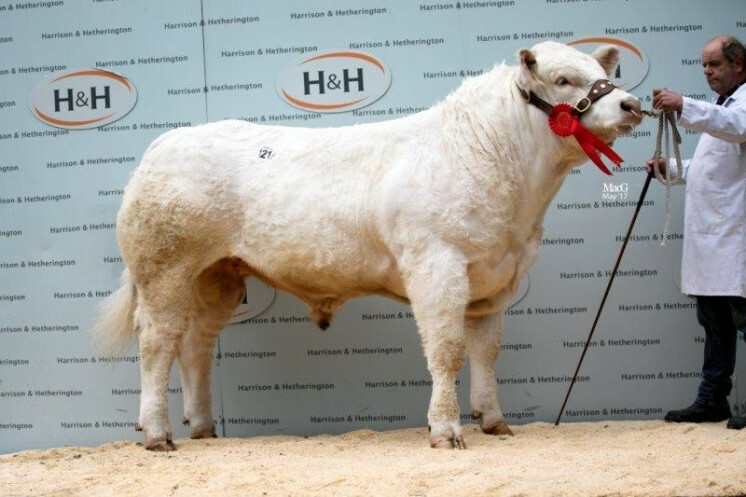 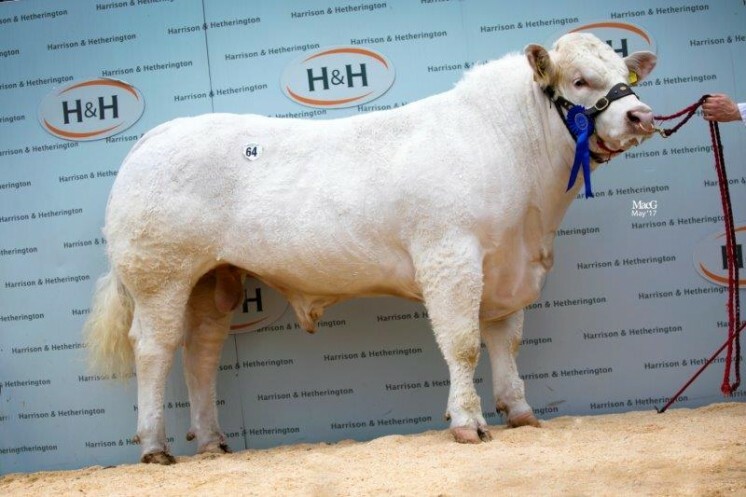 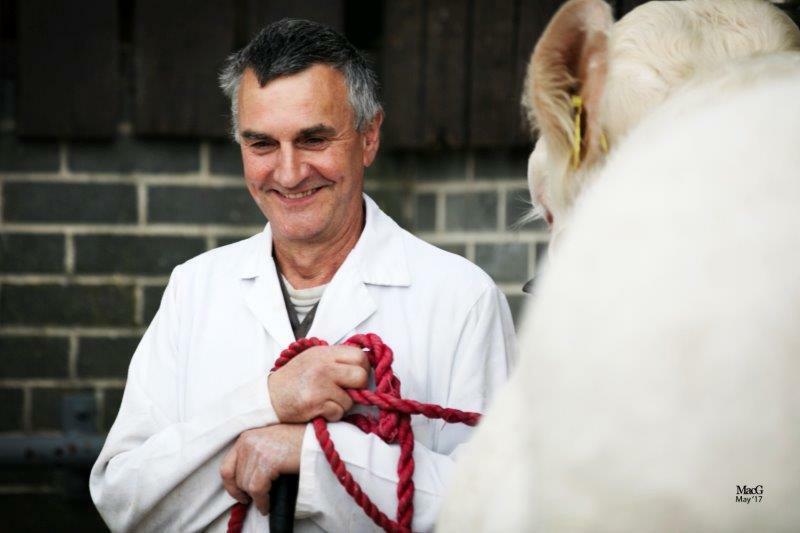 Lincoln was snapped up by RH Thompson and Son, Bishop Auckland, County Durham, from breeders and exhibitors Caylers Charolais, Nuthampstead, Hertfordshire. 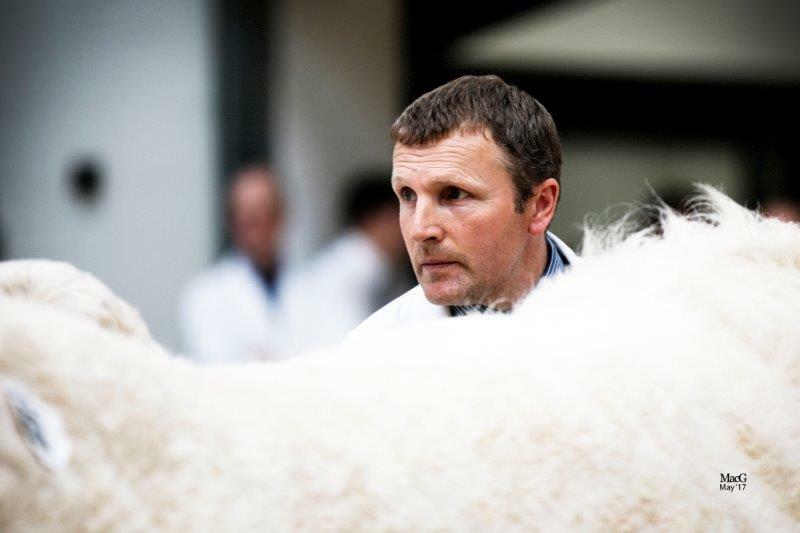 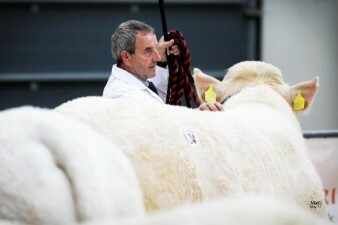 Another entry from Caylers Charolais was next in the trade stakes at 9,000gns. 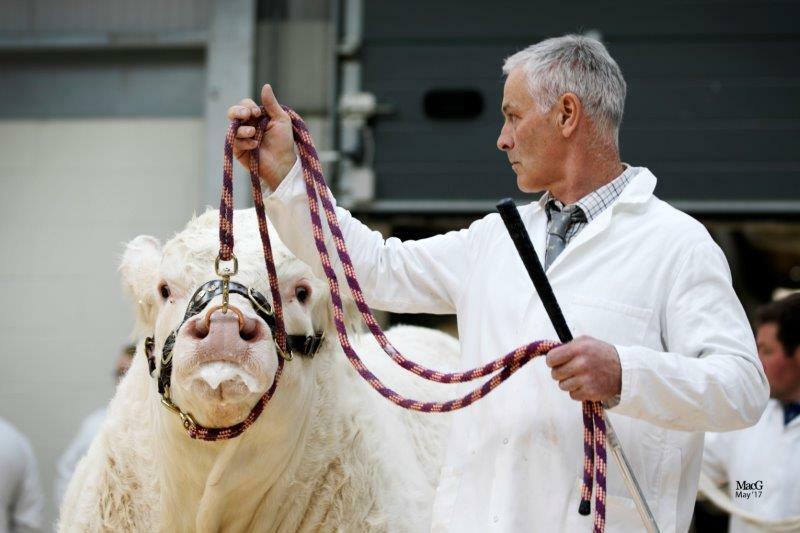 Caylers Limerick an October-2015 born lad, also sired by Balthayock Hamish and out of the homebred dam Caylers Iona, a daughter of Goldies Eddy, sold in a two-way split to WK and P Drysdale, Blairgowrie, Perthshire and Michael Massie, Auchnagatt, Aberdeenshire. 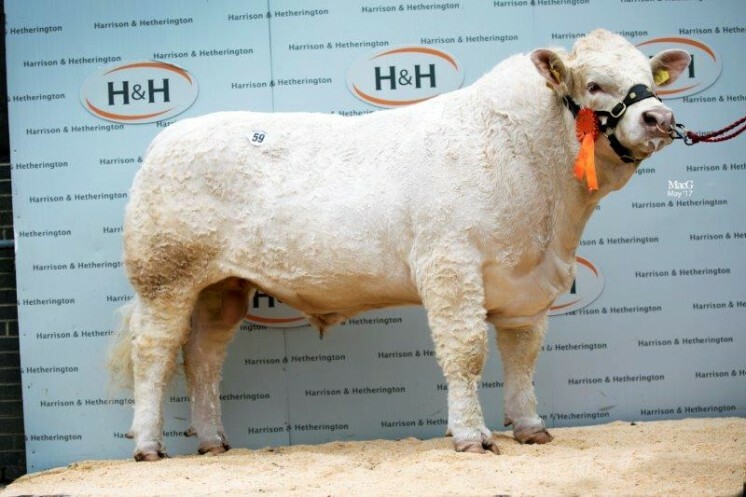 Also hitting the 9,000gns price tag was the first of three top priced bulls from the Dumfries-shire home of Hamish Goldie, who sold a total of six averaging £6,877.50. 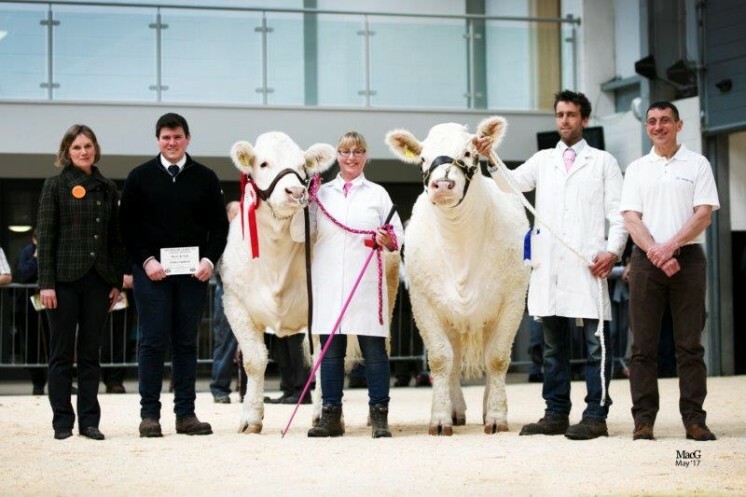 All three were November-2015 born and the first to sell was Goldies Lawson, who had been awarded the intermediate and reserve overall male championships in the previous day’s show. 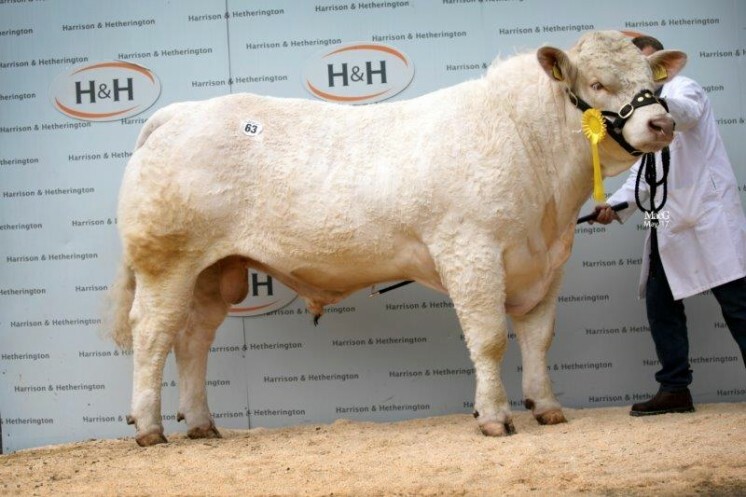 Goldies Formidable is the sire of this one and the dam is Goldies Violin who has bred bulls to 26,000gns and who goes back to Thrunton Trademark. 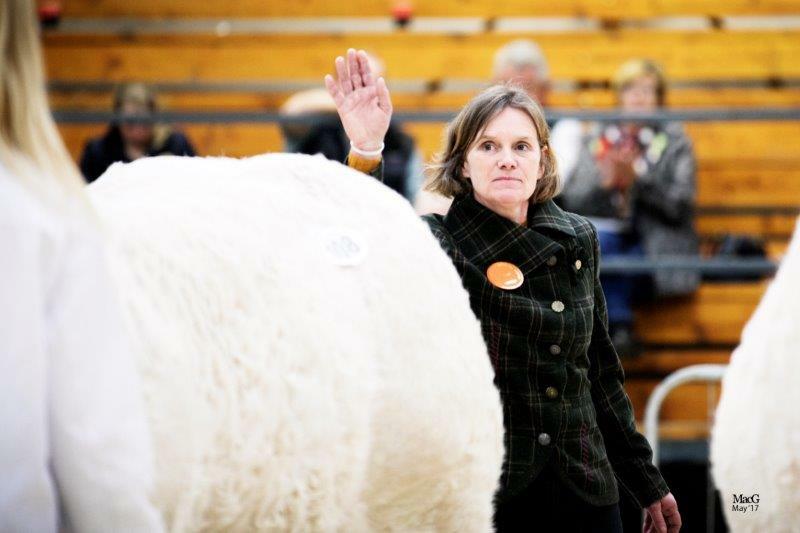 Pre-sale judge Jane Haw showed the courage of her conviction when she purchased Lawson on behalf of breeders Mr and Mrs Andrew White, Worth Matravers, Dorset. 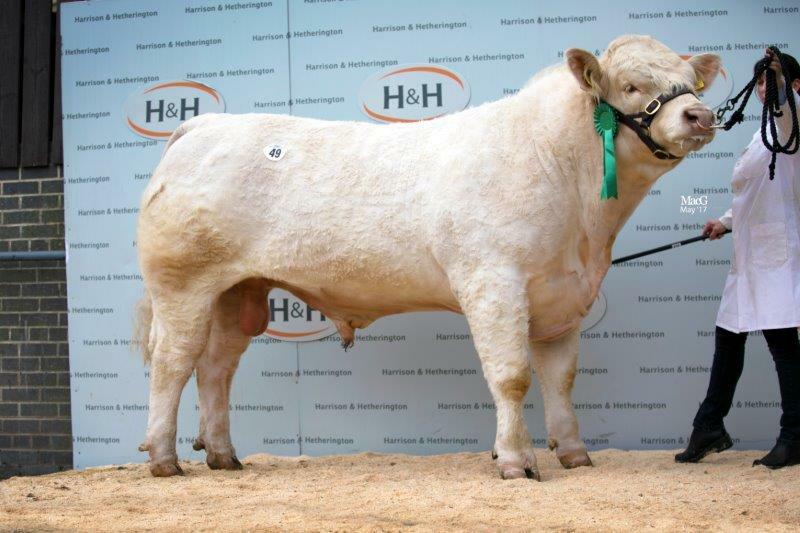 The very next lot was the first of two to sell for 8,000gns for Mr Goldie, this time selling to Ouston Farms Ltd, Gateshead, Tyne and Wear. 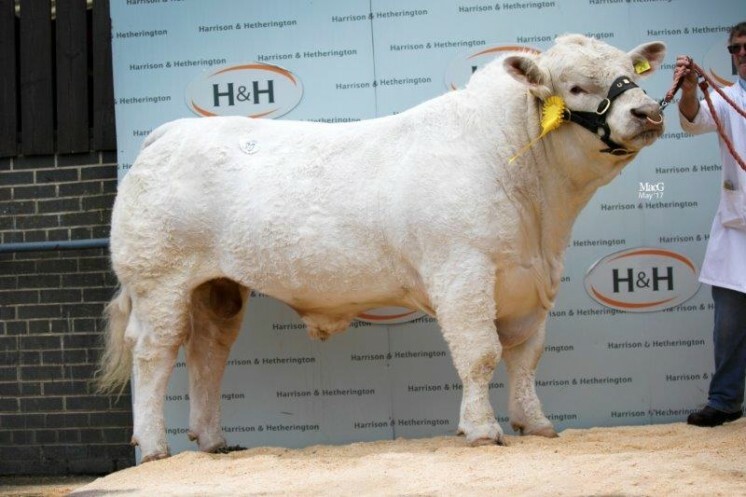 Goldies Limelight is a son of herd sire and homebred Goldies Formidable, whose previous sons have sold to 26,000gns and 23,000gns and dam Goldies Collette who goes back to Goldies Vicechancellor. Mr Goldie’s next lot Goldies Landlord by the 15,000gns Grentahouse Heman and out of the 12,000gns Goldies Elation sired Goldies Hazel, also made 8,000gns when he was knocked down to AH Fisher, Stranraer, Wigtownshire. 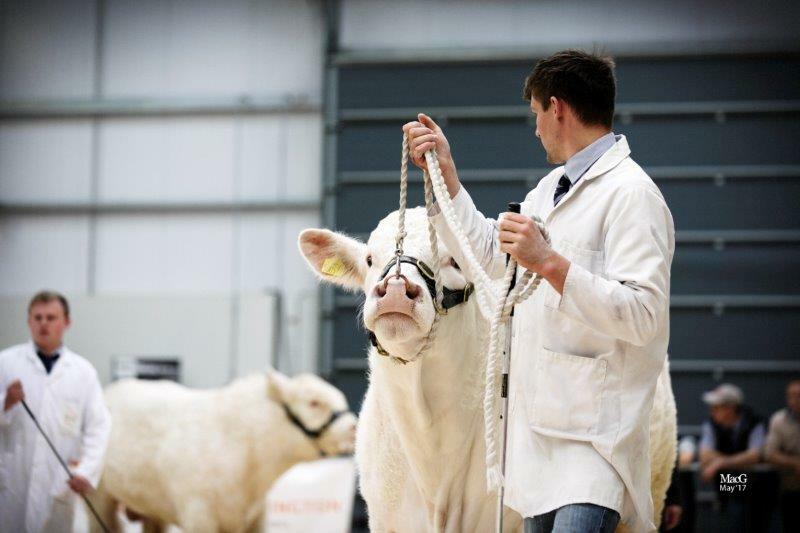 Another 8,000gns lot was the 18-month-old Elgin London, who had placed second in his class at the pre-sale show. 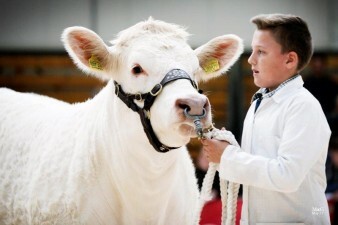 London who was bred and exhibited by Robert Milne, Elgin, Morayshire, is a son of the 14,000gns Westcarse Houdini and Elgin Honey who is sired by the 10,000gns Thrunton Alpha. Rachel Dawson, Newton Burgoland, Leicestershire was the purchaser. 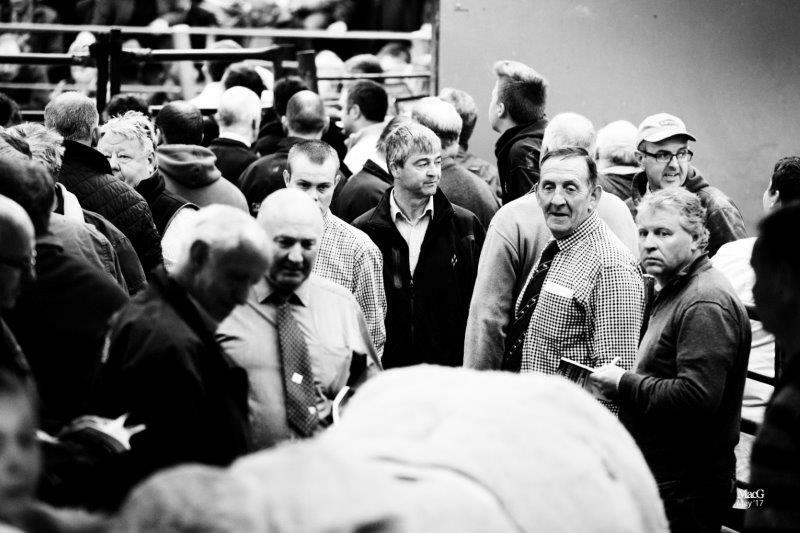 The final bull to make 8,000gns was an entry from Wyn and Diane Rees, Llangurig, Powys, and stays local as he caught the eye of GL Davies, Brecon, Powys. 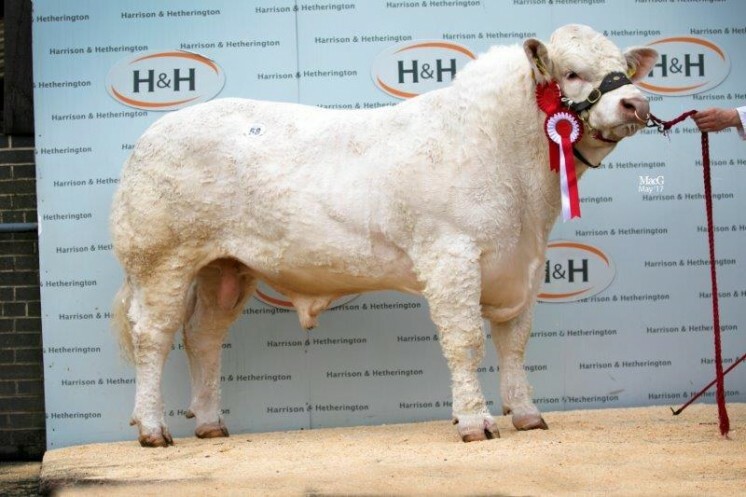 The class winning and February-2016 born Hendy Messi, is out of the Tullygarley Rollerball daughter Hendy Chanel and is sired by the 19,000gns Doune and Dunblane Show champion Corrie Alan. 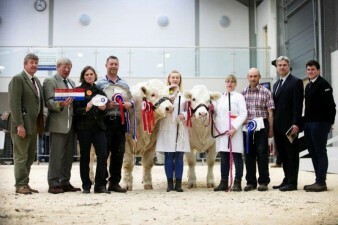 Mr and Mrs Andrew White, who had purchased the reserve male champion earlier in the day were the next to make a sale with Balbithan Mercedes, a 15-month-old who has already been shown successfully being awarded male champion of the Royal Berkshire Show and reserve male champion at the Royal Cornwall. 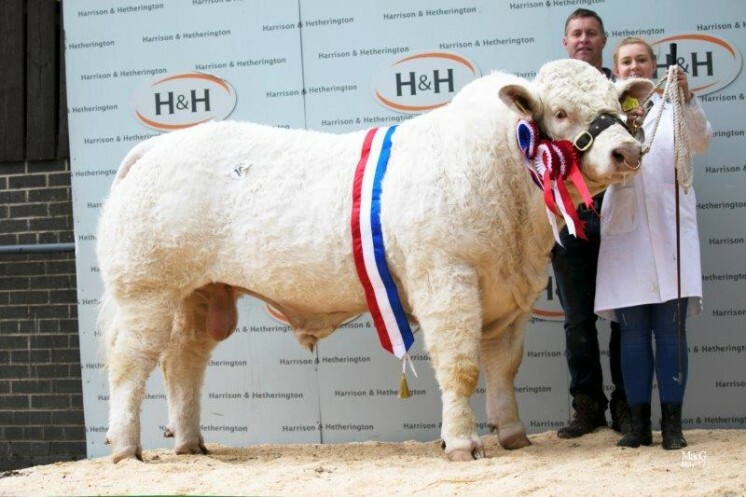 He is sired by popular AI bull Goldies Eddy and his dam the 12,000gns Newhouse Benson daughter Balbithan Faith, who is no stranger to the show ring herself boasting Royal Cornwall show reserve supreme and female champion among her many show accolades, was purchased in a 7,500gns deal by G Jones, Llanrwst, Conwy. 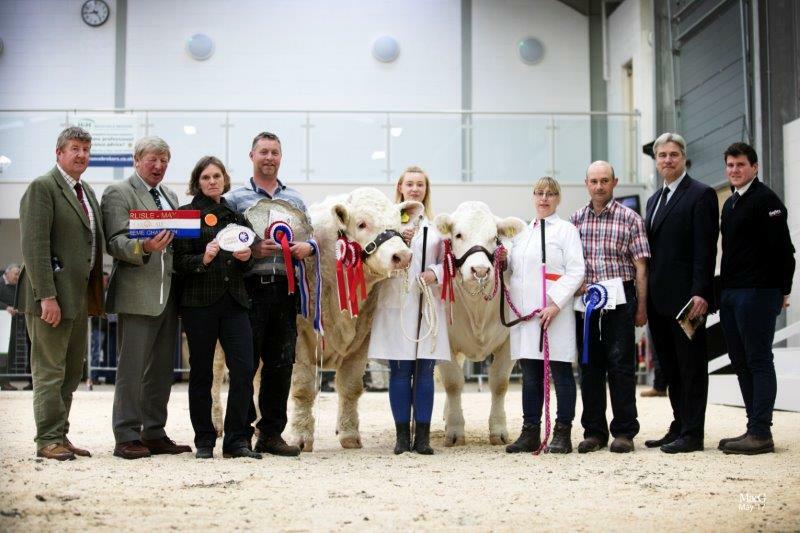 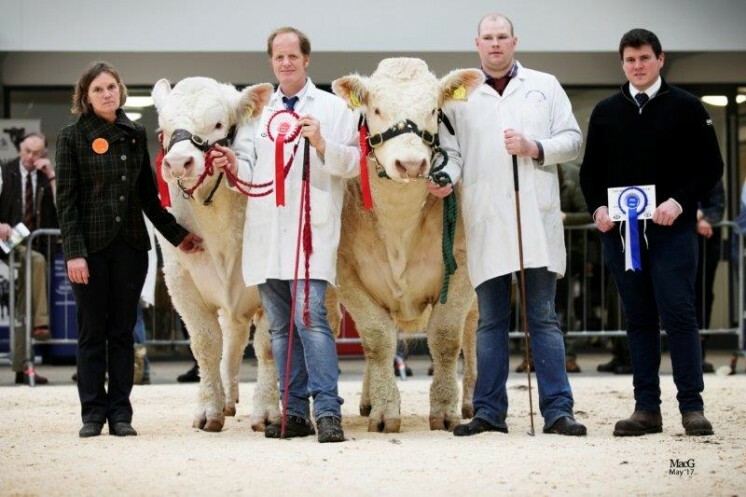 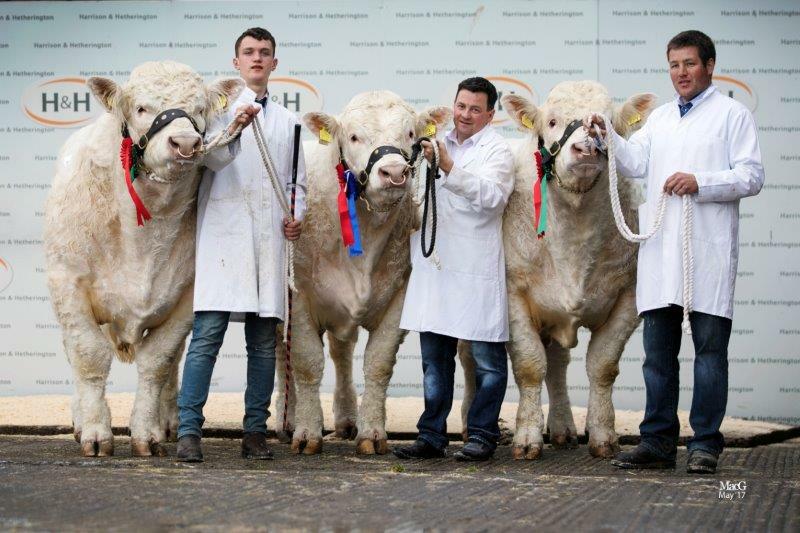 Four bulls sold for the next highest price of 7,000gns, the first being purchased by John Weir, Stow, Selkirkshire. 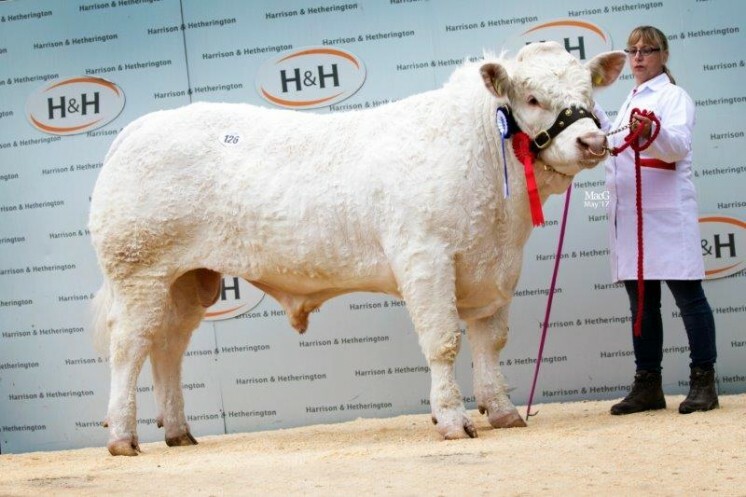 Glenrock Lazerus, an October-2015 born class winner, sired by the proven high performing short gestation and easy calving Blelack Digger and out of the £15,000 Lowerffrydd Benhurr sired Glenrock Harriett, was bred and exhibited by Stephen Illingworth, Eaglesfield, Dumfries-shire. Two more sold at 7,000gns and both were from breeders John and Sandra Middleton, Upper Creevagh, Co Derry. The first was Hollywell Lewis, who was a red ticket winner at the Northern Ireland Pedigree Calf Fair last November and who is a full brother to the intermediate champion from last year’s sale here. Gelston Castle Farms, Castle Douglas, Kirkcudbrightshire, liked the look of this 18-month-old son of the Highland Show reserve beef breeder bull Elgin Davinci. 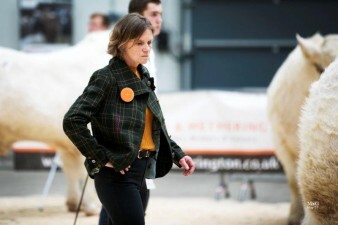 The Middleton family’s next lot and matching the 7,000gns price tag, was the pre-sale show reserve junior champion and one of the youngest lots of the sale at just 13-month-old. 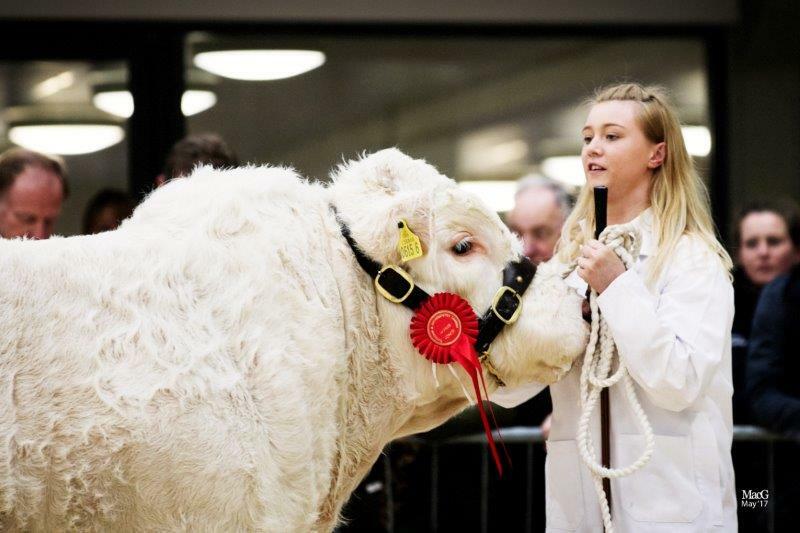 Hollywell Montana who is sired by 25,000gns Perth supreme champion Goldies Unbeatable and is out of the Stirlingshire-bred 10,000gns Mortimers Echo daughter Westcarse Honey, heads on to work in Newton Stewart, Wigtownshire for A and T Wilson. 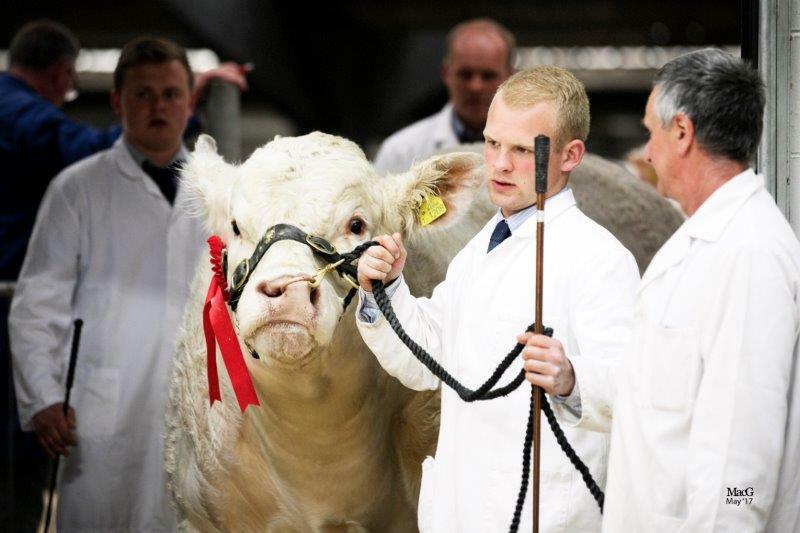 Also selling for 7,000gns was Tweeddale Marcus, a January-2016 born blue ticket winner who caught the eye of Stan Abel and Co, Llanidloes, Powys. 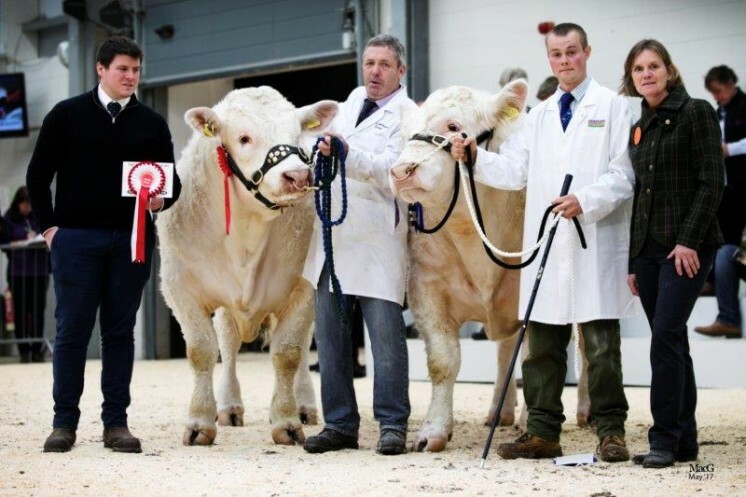 Marcus is by the well-known AI sire Blelack Blackberet, while the dam is Goldies Gleam, a cow by the 14,000gns Perth reserve senior champion Goldies Banker, and was the first of five to sell for Jonathan Watson and Co, Berwick Upon Tweed, Northumberland. 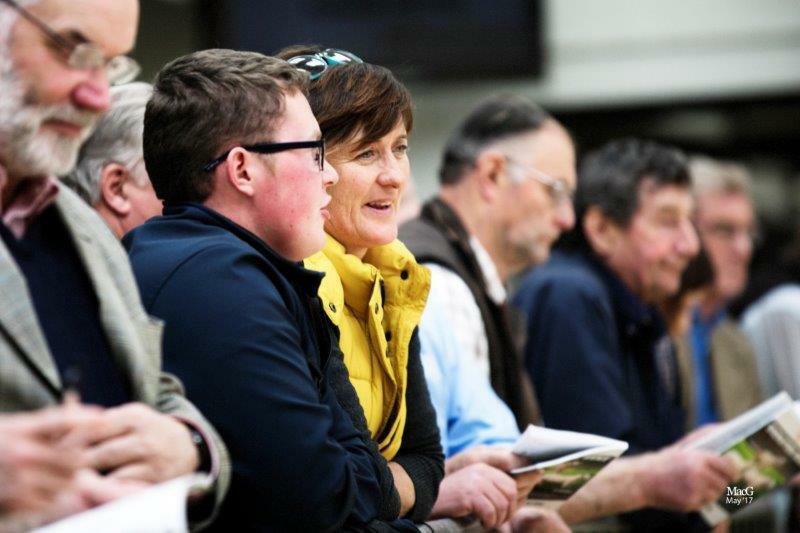 Mr Watson’s next lot was the yellow ticket winner Tweeddale Lothario, a 17-month-old 11,000gns Woodpark Elgin son, who was purchased by RA Davies, St Asaph, Denbighshire, for 6,500gns. Caylers Charolais who sold five in total to average £7,455, matched the 6,500gns selling price, this time with Caylers Lysander who had been tapped out first in his class at pre-sale show 24 hours earlier. 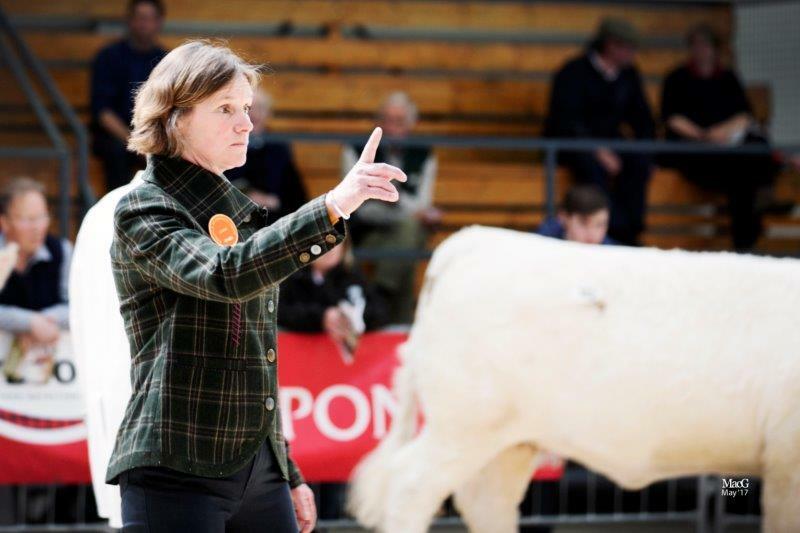 The December-2015 born Lysander sired by the 10,000gns Thrunton Goldeneye, found a new home in Westray, Orkney with T and M Seatter. 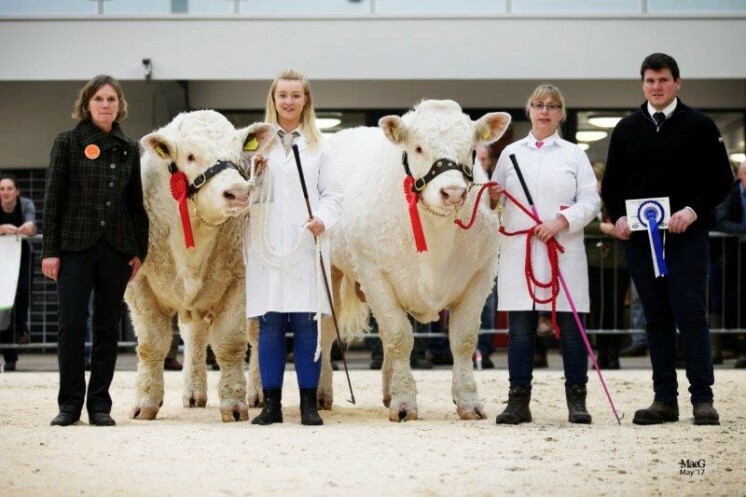 There was a strong and steady demand for females with the section peaking at 7,000gns. 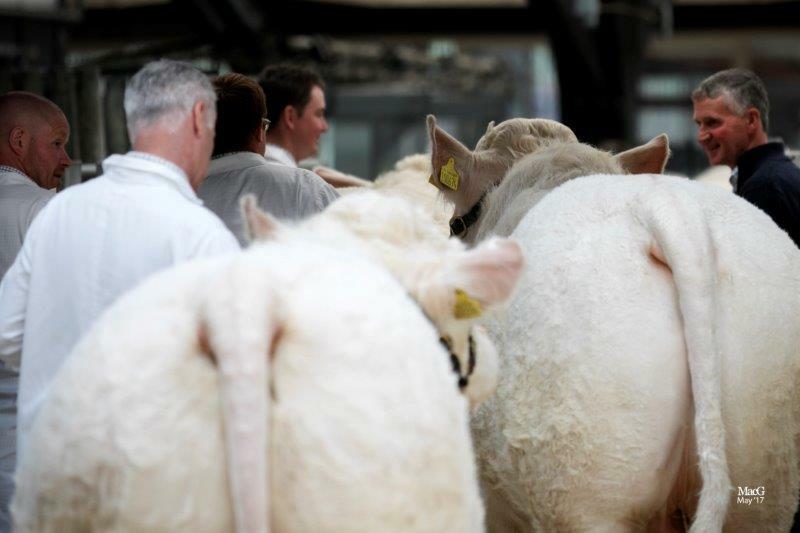 Seven cows and calves averaged £3,570 and the nine heifers sold cashed in to an average £3,190. 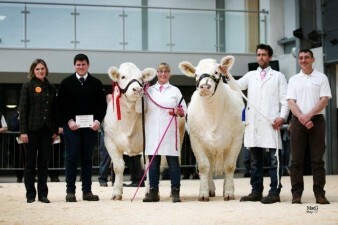 John and Sandra Middleton’s reserve supreme and female champion Hollywell Latin lead the female section. 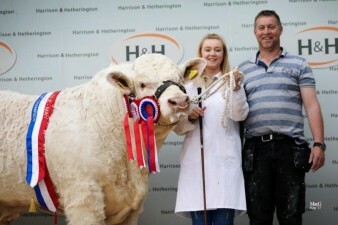 Latin who heads back to Ireland with H and H Heron of Newtonards, County Down, is 20-month-old daughter of Thrunton Fairfax and Balmoral Show reserve junior champion Hollywell Harmony. Just behind at 6,800gns and selling to TP Atkinson, Ulverston, Cumbria, was the 30,000gns Dingle Hofmeister daughter and October-2014 born Glenrock Jewel, along with her nine-month-old daughter Glenrock Melanie sired by Goldies Eddy. The pair were bred and exhibited by Stephen Illingworth, Eaglesfield, Dumfries-shire. Just two lots earlier Mr Illingsworth had sold another mother and daughter pair, the May-2012 born Lowerffrydd Benhurr daughter Glenrock Harriet and her five-month-old heifer calf Glenrock Marriet who is also sired by Goldies Eddy, sold in a 4,300gns deal to A and JJ Forrest, Biggar, Lanarkshire. 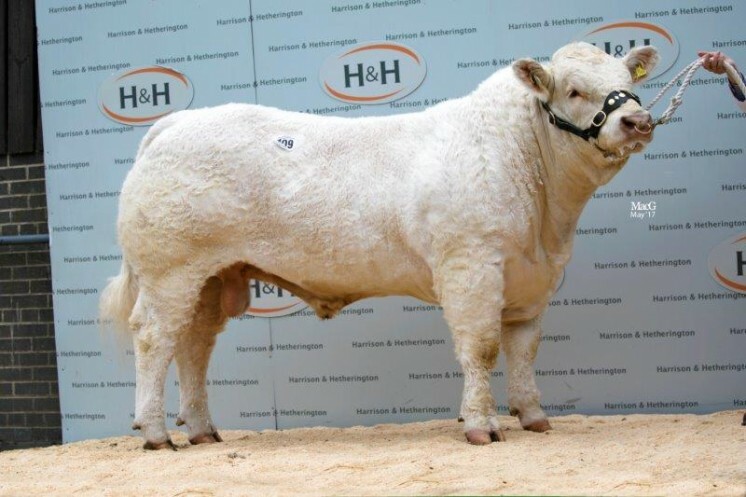 Mr Illingsworth was in the money again a little later this time with the June-2011 born Glenrock Glamour, who was sold together with her six-month-old daughter Glenrock Mercedes who is sired by Blelack Digger. Glamour who is another daughter of Lowerffrydd Benhurr caught the eye of ER Pigs, Rotherham, Yorkshire, who paid 4,000gns for the pair. 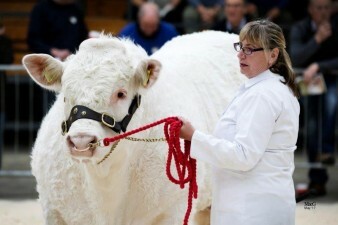 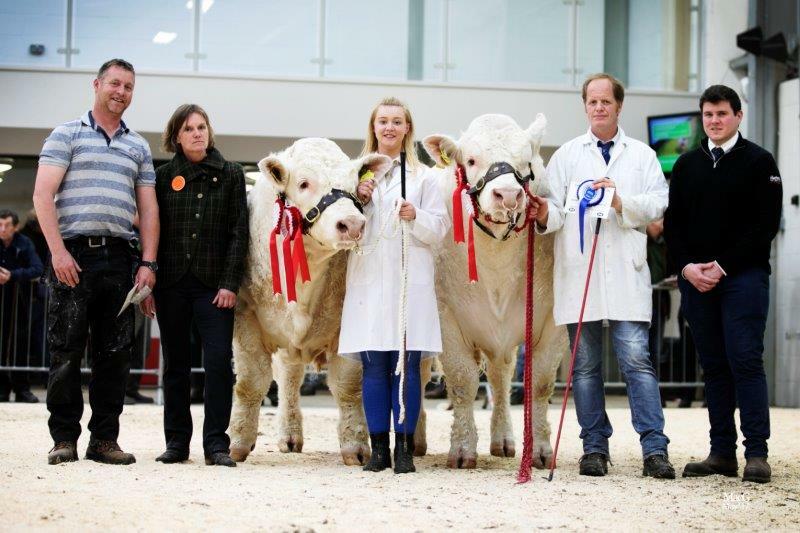 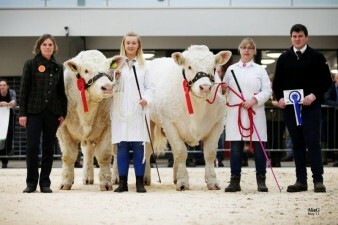 Matching the 4,000gns price tag was reserve female champion Alsnow Louise from Alan Lawson, Hallington, Tyne and Wear. 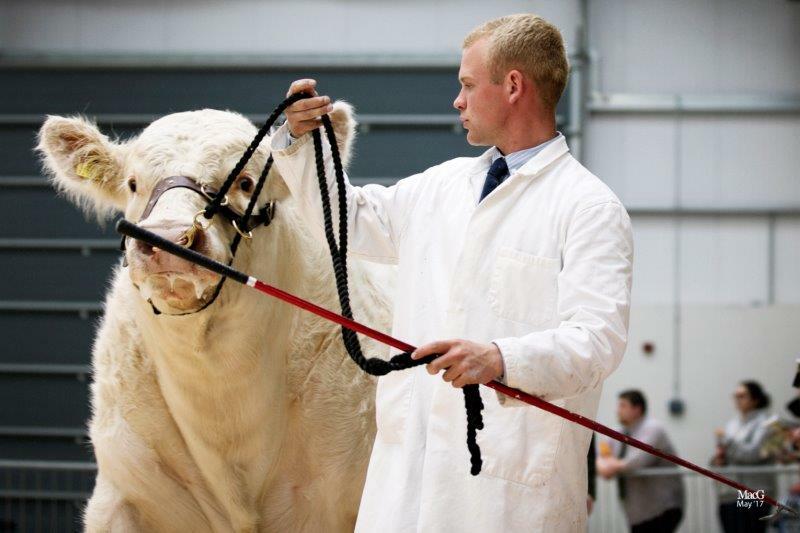 GM Roberts, Gaerwen, Gwynedd, was the last man in on this 22-month-old 10,000gns Puntabrava Federico daughter, whose dam Alsnow Harmony who goes back to Blelack Digger. 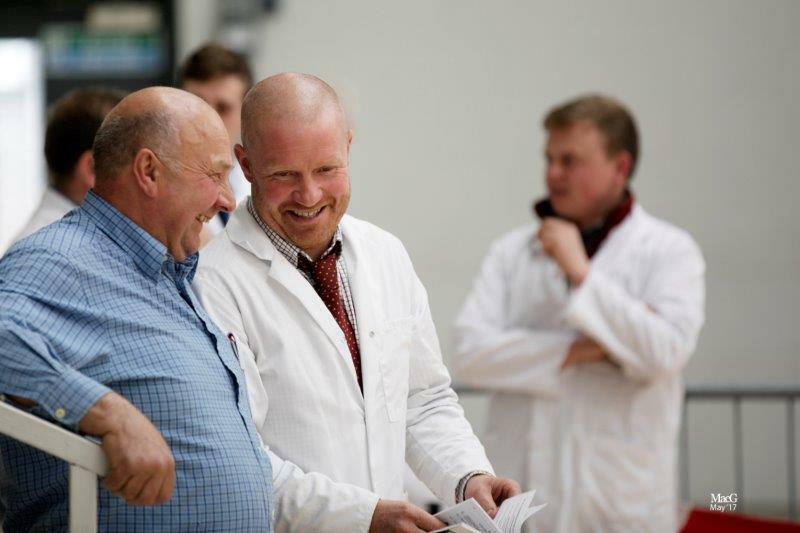 An added feature of the sale was a draft from the Thrunton herd of JHC Campbell and Sons of Alnwick, Northumberland, where 21 cows were sold with calves at foot. The top priced at 4,000gns was the first lot of the section, mother and daughter pair Thrunton Goddess and Thrunton Majesty. 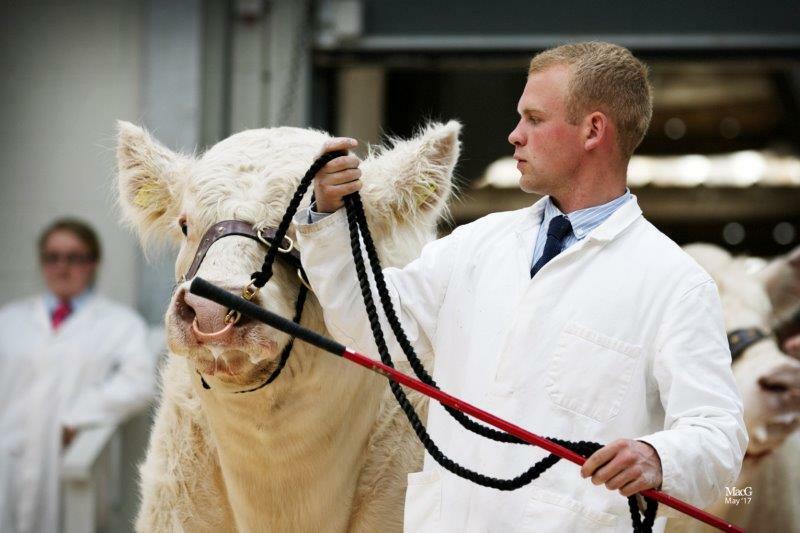 Goddess is a December-2011 born daughter of the 26,000gns Stirling senior champion Balmyle Dickler and dam Thrunton Adalaide herself sired by the 15,000gns supreme Carlisle champion Burradon Talisman. Her 10-month-old daughter Majesty is sired by the 26,000gns Maerdy Hearthrob and the pair head up to Canonbie, Dumfriesshire with Tom Story. 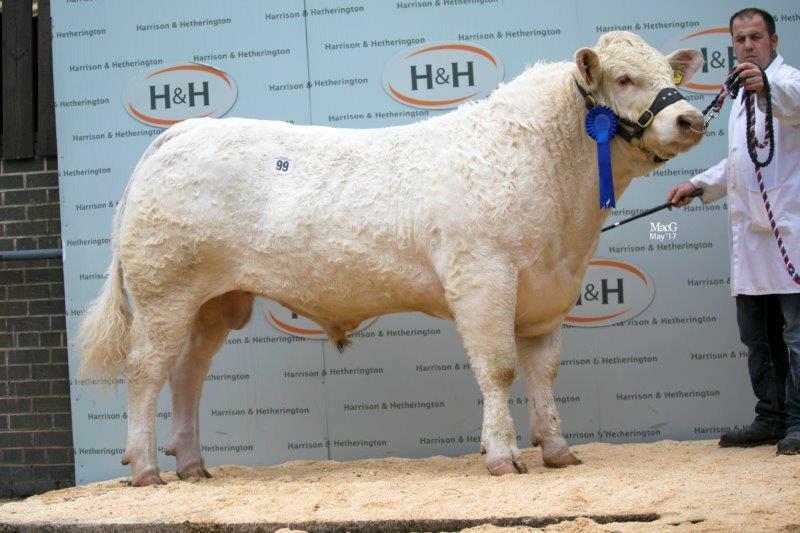 Next to sell for John and Ed Campbell was a mother and twin calf outfit, this time selling for 3,200gns and travelling back to Northumberland with purchaser J Charlton of Dudley. 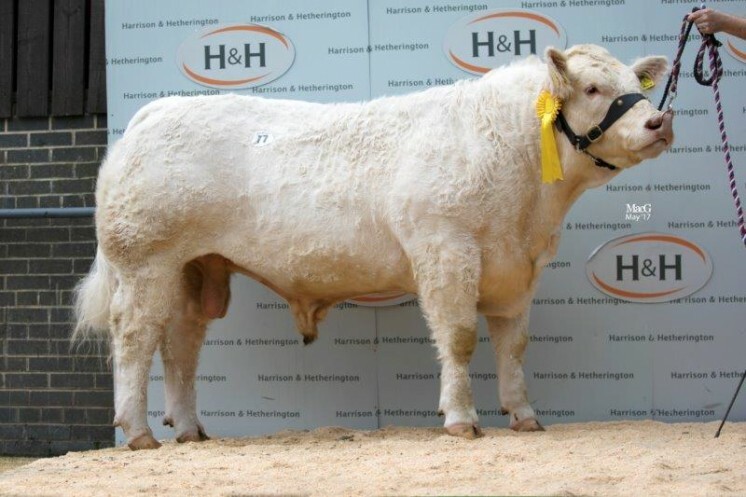 Thrunton Dewdrop is the July-2008 born dam who is sired by the aforementioned Burradon Talisman and her two ten-month-old daughters Thrunton Missdaisy and Missmarple are sired by the home-bred Thrunton Gladiator. 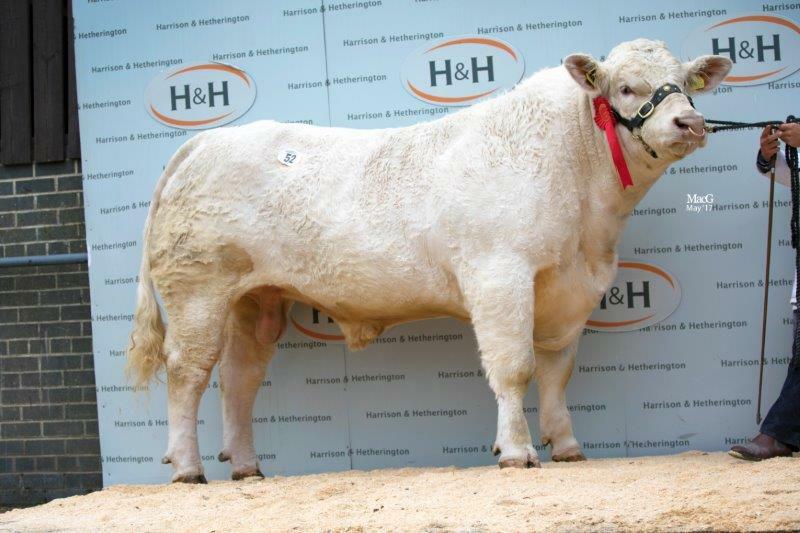 Selling at the same price of 3,200gns was another Thrunton pair. The February-2010 born, 22,000gns Newhouse Bigal daughter Thrunton Fallon and her seven-month-old heifer calf Thrunton Maradona by Balmyle Dickler were purchased by A and JJ Forrest, Biggar, Lanarkshire. 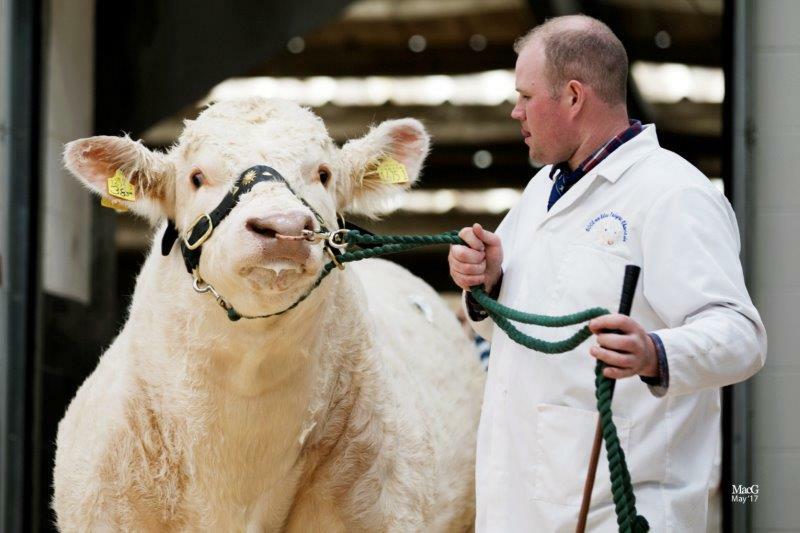 Averages: 72 Bulls £5158.13; seven cow and calves £3,570; nine heifers £3,190.83; 21 Thrunton cows and calves £2,467; two Thrunton Heifers, £1,811. 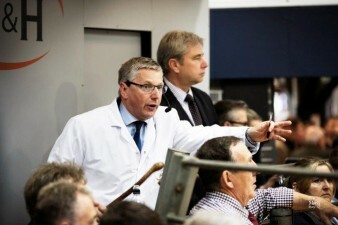 Auctioneers: Harrison and Hetherington Ltd.